Then she made...: Another fall tradition. I've been working on a subway art project that is HUGE so I'm a little occupied lately. 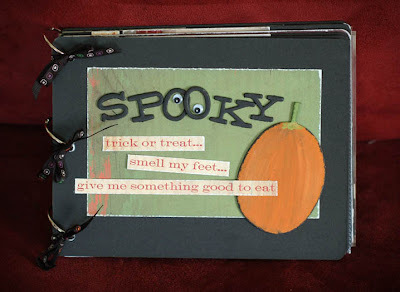 However, I've been thinking about all things fall and I must admit that I can't wait to add to my Halloween book. This little book is another one of our fall traditions. We pull it out sometime mid-September and keep it out until Halloween. Then, after Halloween I add new pictures and tuck the book away until next year. It's fun for the girls to look through all their past costumes and I love that I have a little organized spot all ready waiting for this year. Here's a look at what I've done in the past. Now if my kids would just decide what they want to be this year, I could start making their costumes. Of course, that's after I finish my current project. LOL!!! That's a really cute idea. I might have to use this idea to make one for my niece.